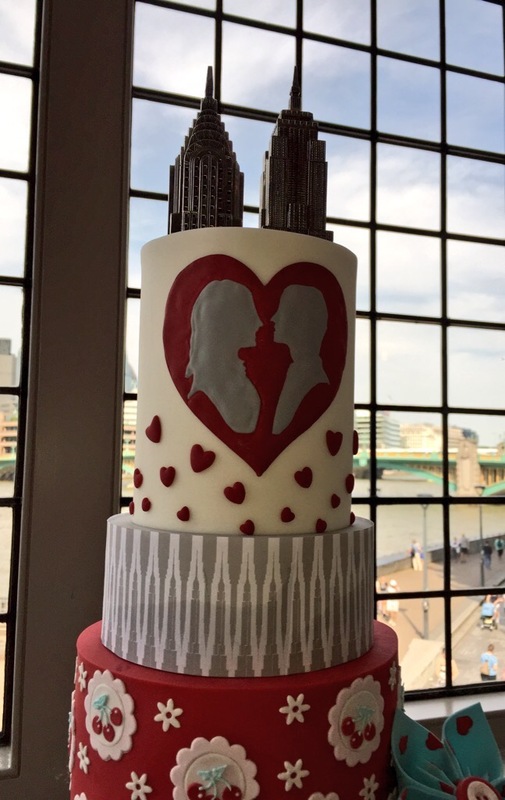 During 2015 I noticed a lot of couples adding a wedding cake silhouette to their cakes. This is a great way to bring the theme of silhouette into the wedding. Some of the cakes are really creative. I cut these silhouettes from paper during a Skype session before the wedding. 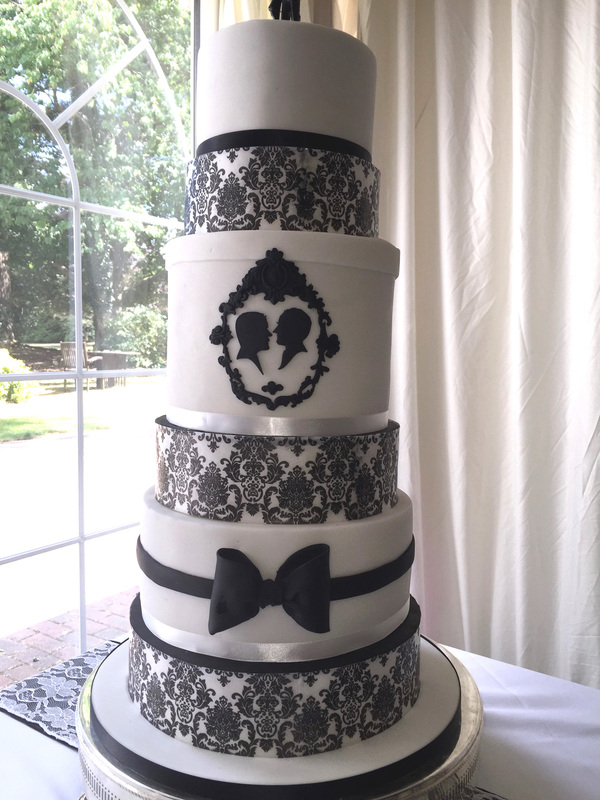 The bride and groom gave them to their cake designer who recreated them in white icing sugar on the side of the cake. 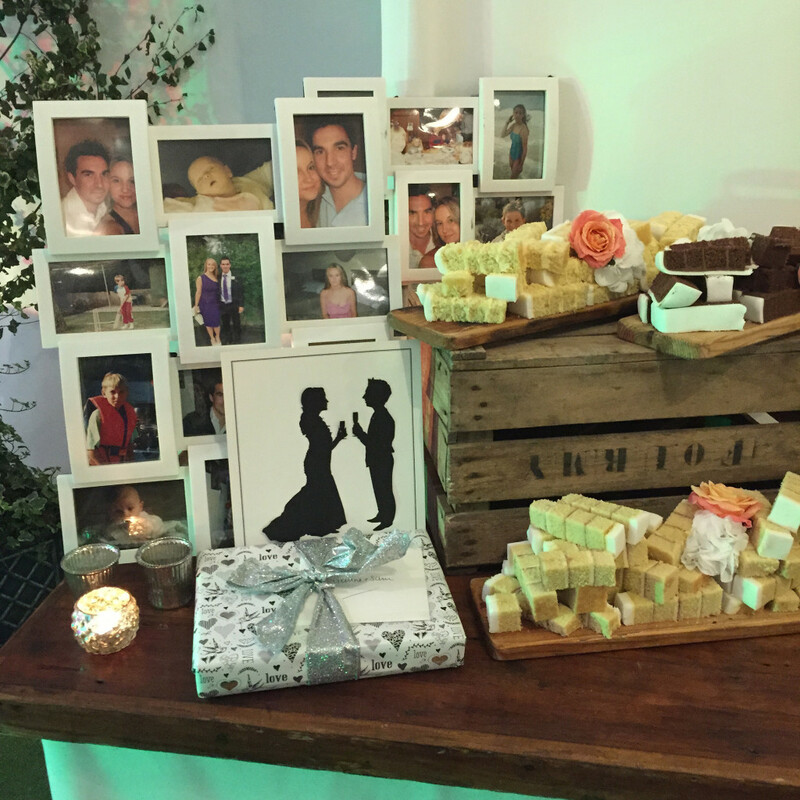 The wedding was a 1950s-theme event in London. The two buildings are on top of the cake! These silhouettes of two grooms were cut by Alison Russell at an event, some years before they got married. They have then cut out of black icing and used as a focal point on the cake. 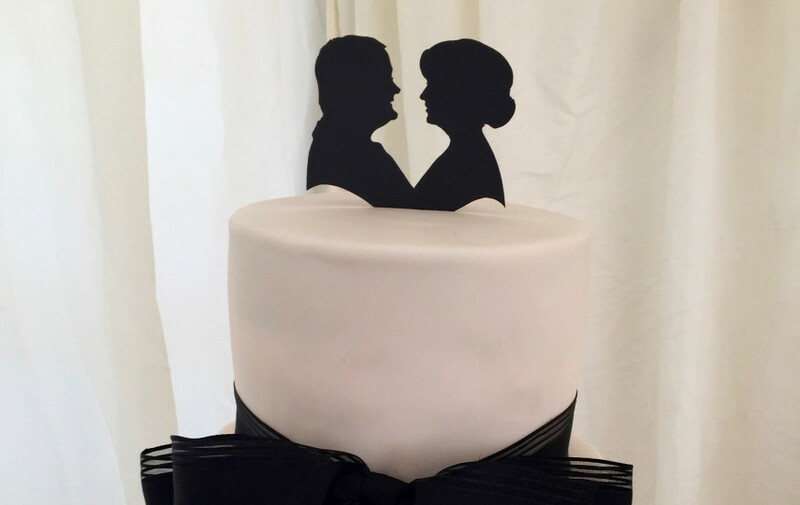 I cut these two silhouettes from stiff black card during a Skype session with the bride & groom. The cutting included a card spike, under the silhouettes, which they pushed down into the cake. 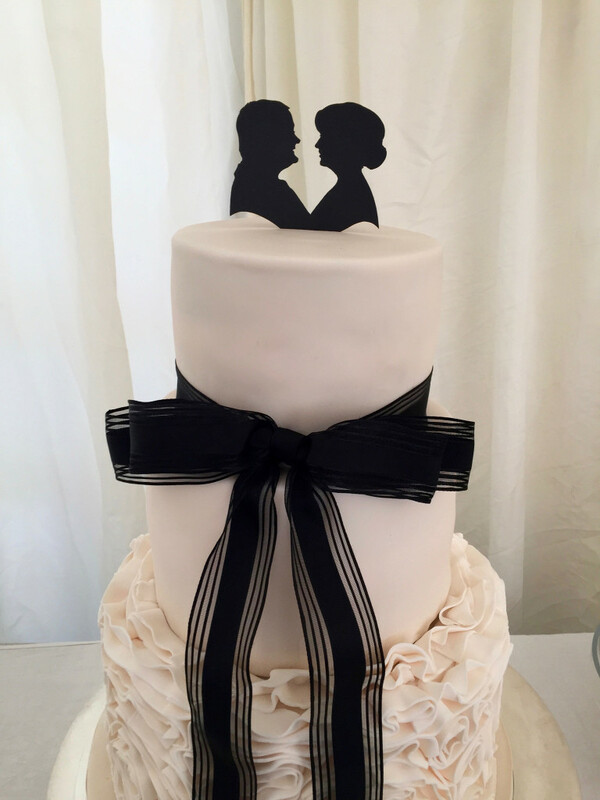 This cake topper was cut with scissors from stiff black card, using photographs sent by the bride and groom. The photographs were taken during fitting sessions for the dress. The cutting includes a spike to fix the silhouette to the top of the cake. Full-length silhouettes of the bride & groom, which I cut on the day and mounted on card. The cutting was displayed alongside the cut cake during the evening party. 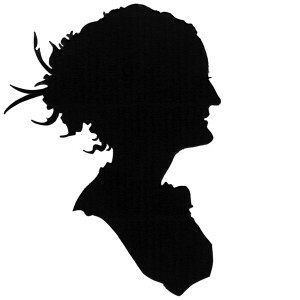 If you are considering booking a silhouette artist for your wedding, I am happy to cut your silhouettes in advance. The best way to do this is via a video link, such as Skype or FaceTime. The silhouettes are yours to do with as you please. You can add them to your cake or use them for the invitations. We can also add them to the silhouette backing cards the artist will use on the day. What a stylish alternative to traditional plastic dolls on the top…. What a fabulous idea the cakes look really beautiful. What a fantastic idea! Will spread the word! Such a great idea to put on the wedding cake!! OMGolly Gosh, what a fantastic concept!! This makes the wedding cake even more personal. 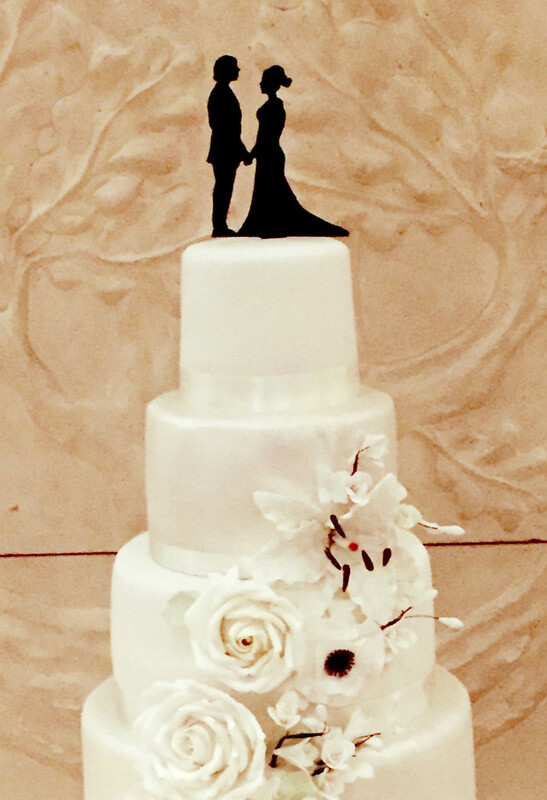 I love the idea of the silhouettes made from icing too. I’m so excited by this concept I want one!!?? I’m going to just rush out in the street right now and grab the first young man who takes my fancy, get down on my arthritic old knees and ask him to marry me. I have already printed off the cake image I like best, the monochrome one, to show him, as I know then he will most definitely say yes. Yes, yes, yes I’ll marry you as I want that wonderful silhouette cake too!! Ah, heavenly bliss, not just the cake but a husband too, I’m in heaven, heaven, heaven…………………………. Now that’s a wedding I’m really looking forward to cutting silhouettes at! Such a gorgeous idea. I want to get married again just to have you cut silhouettes at the wedding reception (so sad to say you were booked up that day). My plan was to make a huge framed collage of all the guests as a big artwork in my house. A lovely way to have ‘pictures’ of every wedding guest out and on display, I’m not sure it’s something you’d really do with photos. But alas, it wasn’t to be – a cake topper is a great compromise! Technology as we all know can be a a boon or a drag – its effect on souvenir photos has been disastrous in our family. Some years ago my four children decided to get married to their partners all within the space of 12 months – joy and fear in equal measures ! Great days as they turned out but what special mementos were we left with ? Sadly as the days of touchy feely photo snaps have gone they are few and far between – spread out on various “devices”. Not the same as opening a drawer or cupboard and handling something that would take you back instantly to the day. We do have albums of course but the cake’s gone off and it would be nice to have something special. If only I knew you then Charles – perhaps I can get you to do the grand children ! Now you need to start cutting rice paper as cupcake toppers! Wonderful silhouettes – particularly the full length ones! They really add something extra special to the cakes. A lovely alternative to a traditional cake topper. Absolutely stunning! Unique and clever idea well done! Love these! I will recommend the idea of a silhouette cake to friends, and I’ll remember it for special birthdays, including my own. Brilliant and stylish. I am a big fan of your work! Guests at my events always rave about your skill and my own father treasures the one you did of me. Quite a few of my friends are getting married this year – these are definitely something I will be recommending, they are so elegant, stylish and unique. Great to see your talented work pushing the boundaries. Oh my goodness, these are just so creative…cant believe your expertise and attention to detail!